A recipe from Pop Sugar Fitness! Check out the blog post I wrote about the salad here 🙂 I followed this recipe exactly so you’ll notice that the directions are exactly the same. Thanks Pop Sugar for an awesome recipe. I will be doing this again! Blend the ingredients for the salad dressing until smooth. 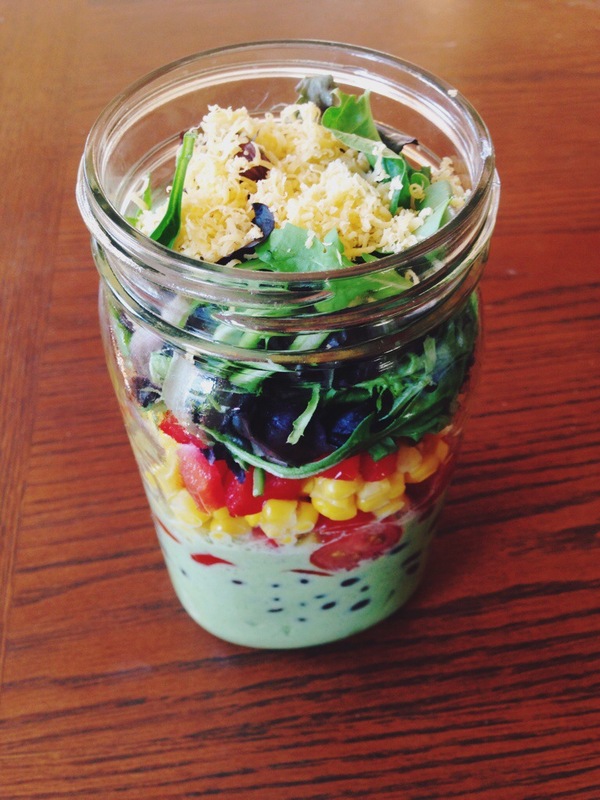 Pour into the bottom of a quart-sized mason jar (wide-mouth works best for filling and eating out of). Then layer the ingredients in the order listed above — cucumbers, black beans, tomato, corn, red pepper, greens, avocado, then cheese. Secure the lid, and store in the fridge for up to five days. You can also pack a small container of tortilla chips to crumble on top when you’re ready to eat.